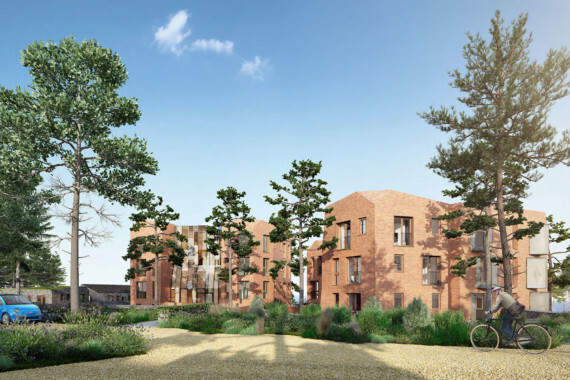 Sidmouth Later Living responds to East Devon’s demand for older people’s housing. 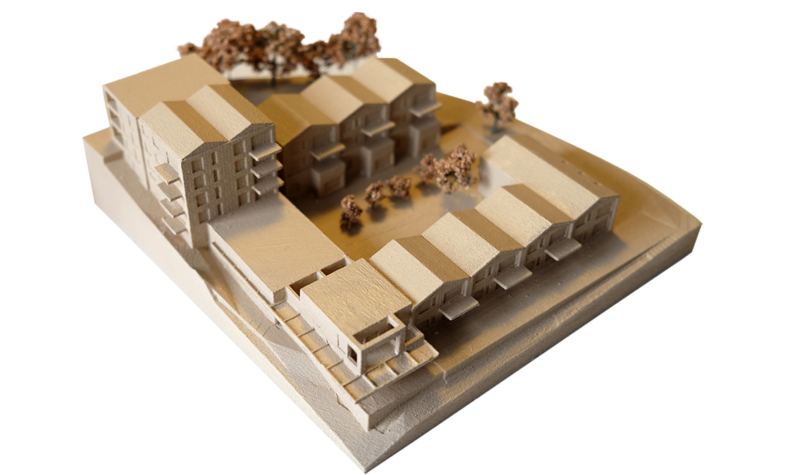 113 apartments provide adaptable homes for later living in a supportive community. 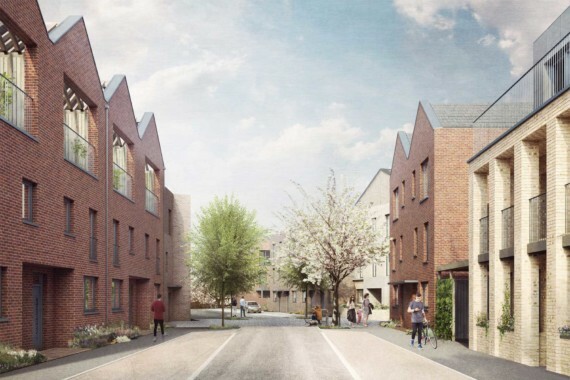 Shared use of a wellness suite, cinema, library, farmhouse kitchen, guest suite, restaurant and communal lounge encourage sociability amongst residents. 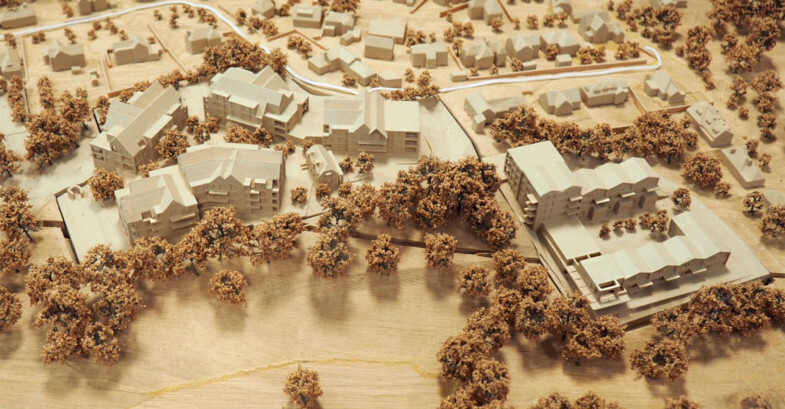 With breathtaking countryside, arboretum and sea views, the project draws inspiration from its magnificent location. The dramatic topography and distinctive character of different areas of the site provide the setting for pavilions and courtyards amongst generous landscaped gardens. The Knowle is an escarpment and hilltop rising west from the Sid Valley. In the 18th century the site hosted a Cottage Ornée with a fantasy garden that included a series of follies and a menagerie, all open to the public. Later it became a hotel, when terraces were added, and is now occupied by Council offices. 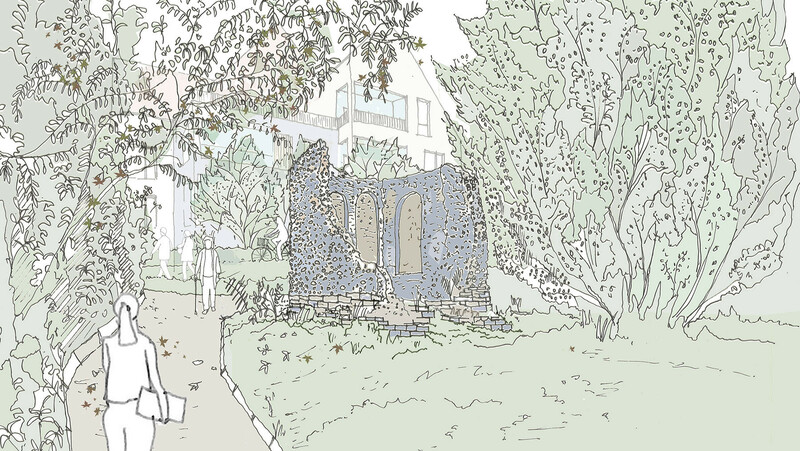 Our proposal captures something of the romance of these early eras. 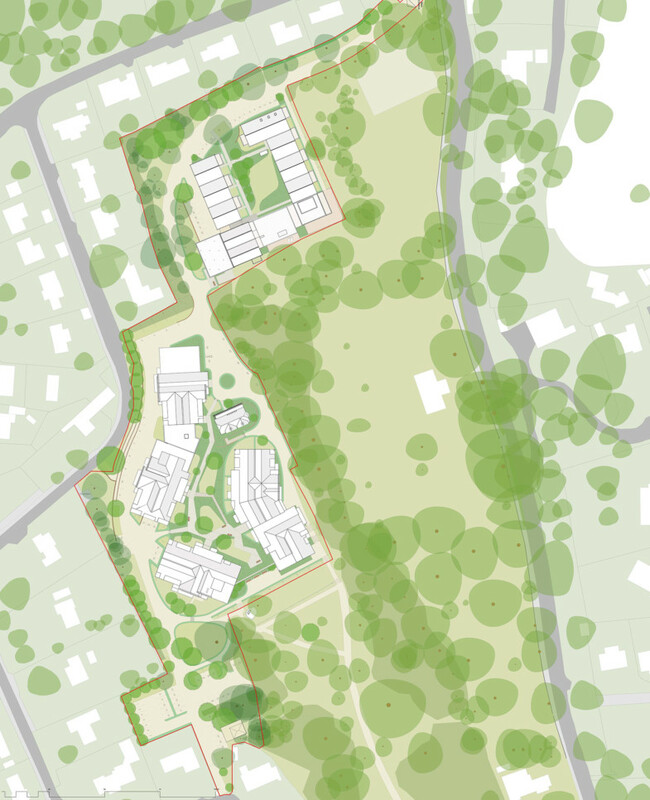 The organisation of the buildings is designed to reconnect fragmented areas of publicly-accessible arboretum and parkland. 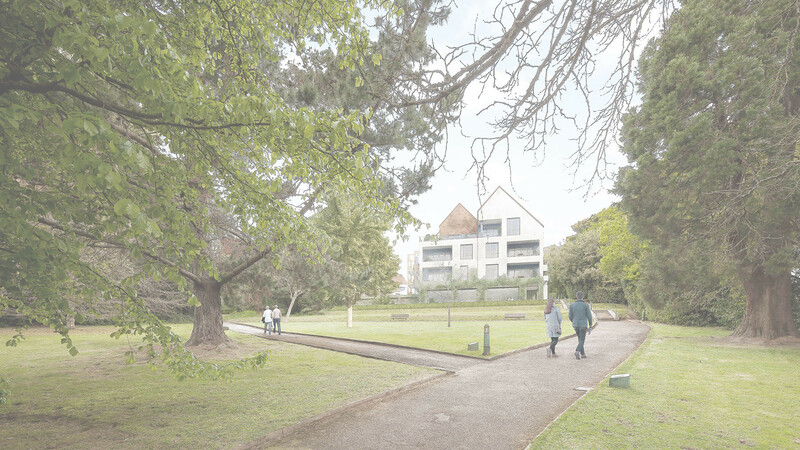 Existing public footpaths through the park have been preserved and their accessibility improved to encourage residents and neighbours to meander through and enjoy the wider site. 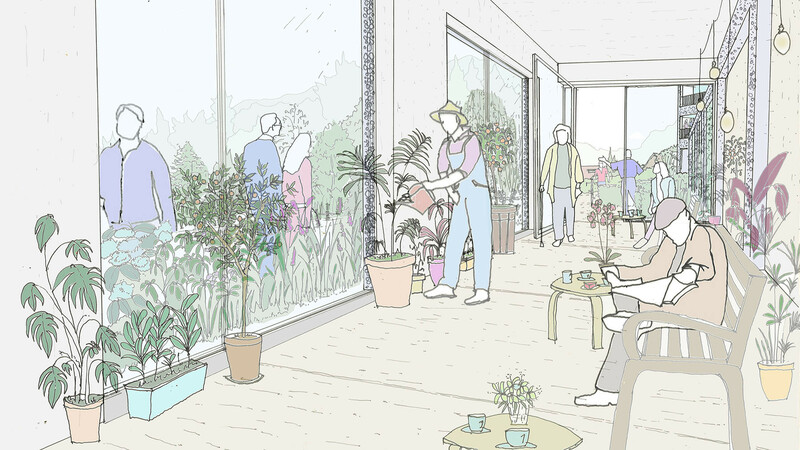 On The Plateau is an informal cluster of apartment buildings surrounding a shared garden. The buildings here are made of white render on a flint base with red plain tile roofs, drawing on the local Arts and Crafts and Devonian vernacular context. Two of the pavilions frame the view to the sea, allowing visual continuity between the upper garden and the lower arboretum while preserving residents’ privacy. At their base, a flint wall separates the arboretum from the Plateau complex, and also houses the public Orangery giving onto one of the historic terraces. 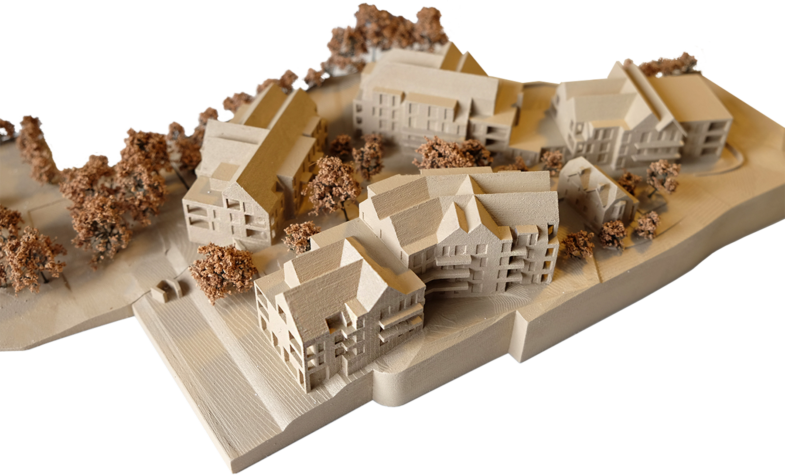 Below the escarpment, a new courtyard apartment complex, the Dell, is located at the head of the valley populated by broadleaf trees. As the first element on the route up to the Knowle, the courtyard plays an introductory role to the whole ensemble. Once again, the buildings here sit on a low plinth of flint and are made of timber with rendered panels. A gateway building at the crest of the hill marks the arrival at the Knowle. 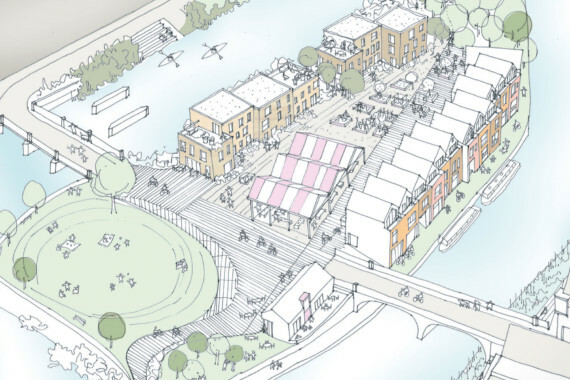 The proposals aim to promote community and belonging through shared outdoor spaces and activities. 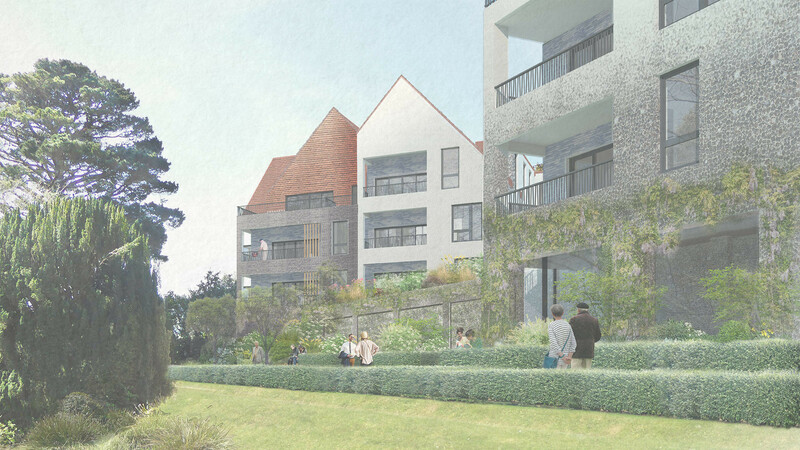 On the Plateau apartments can be accessed through the shared garden. Timber balconies overlooking it provide individual amenity space with superb views over the surrounding hills. Ample storage for mobility scooters and cycles is provided in each building.